Shoppr's Jolly Hunt: Score Some Shopping Vouchers This Holiday! Get The Best Makeup Look Just In Time For Holiday Season! It’s the most wonderful time of the year and what a great year it has been! With only a week left to usher in a fresh new year, we at Shoppr have got something exciting lined up just for you, our dear shoppers! Step 2: Answer ALL 7 questions in the quiz below. Step 3: Wait for an email from us to see if you have won! Told you it’s easy! The more questions you get right and the earlier you submit your quiz, the higher chances of scoring those shopping vouchers! But hurry, contest ends 7th January, 2018 so what are you waiting for? Get quizzing! It is never too early to welcome the holly-days! Malls, restaurants and popular streets are already decked out in festive gears, so why shouldn’t you?After all, it IS the most wonderful time of the year. Now we are not saying you should preen like a Queen, but there are a myriad of ways to make your look more wearable for a night out with your girlfriends and even full-blown parties! Read on to get some tips on how to look made up without much effort every time. Not to sound cliché but the eyes are the windows to your soul, so what better way to decorate your window with some eye-catching (no pun intended) colours. Skip your regular eyeshadow for a rich sparkly hue and blend a darker shade into the outer creases of your eyes for some depth and dimension. If a sparkly eyeshadow sounds too intense for you, swap the look for a milder option with a coloured or glitter liner, which is also great to add a subtle glimmer to your peepers. Adding a blusher is a makeup step that is often overlooked in our daily rush-to-work routine. But that swoop of colour on your cheeks can actually brighten up tired skin and highlight your cheekbones! Not to mention, it looks extra flushed when you are under the “ahem” mistletoe. Bonus! Opt for a pink base shimmer rather than the usual champagne or golden hue for an extra touch of rosiness. If you are staying out late for a party, use a cream blush so it stays on longer for a blushing great night! You don’t need someone to kiss in order to show of those puckers! First, keep your lips plump and moisturized with a hydrating lip balm. Once you have smooth canvas to work on, play around with some colours! A bright red shade is usually the trend during the festive season but feel free to play around with different textures and colour shades. Go for a totally metallic lip or if you prefer playing it safe, opt for a classic gloss for a full, juicy pout. Remember to tone down your eyes if you want your lips to be the focus of your look. Rejoice! Tis the season to bring out the brightest and most glittery of all nail polish shades. Just remember this rule of thumb, neutral and tonal hues are great for short nails as it helps elongate your finger while dark and gothic shades add a dramatic flair to longer nails. For an added dazzle, coating your polish with a layer of sparkling gold shimmer will accentuate your fingers and nail that look! Just be sure to protect your nails with a topcoat polish before applying all those layers. Have fun experimenting and be sure to #shopprapp so we can feature your holiday look! Ranked as one of the top most downloaded mobile app, Instagram has solidified its spot in everyone’s phone. 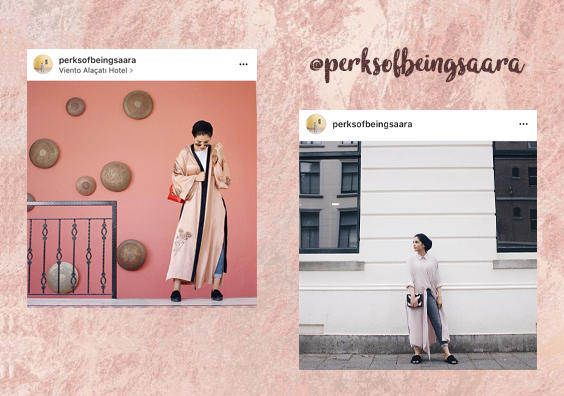 From foodies, fashionistas, to globe trekkers and even meme lovers, there is a place in Instagram for everyone. 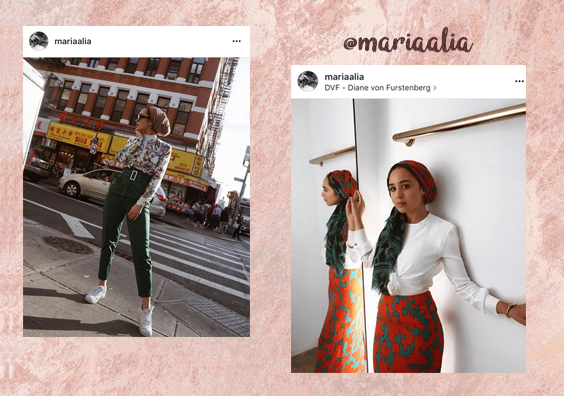 Being more than just a photo-sharing app, Instagram is now - more than ever - a tool of self-expression and representation. 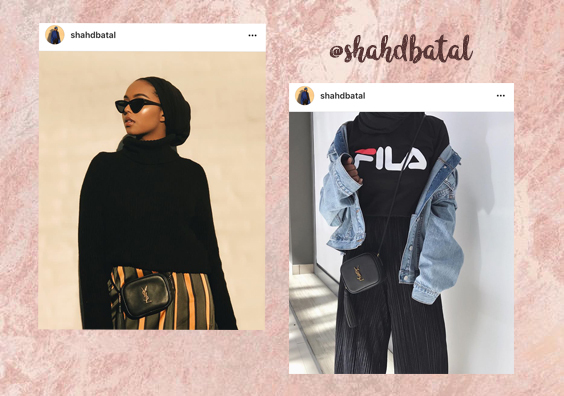 Much like a fashion magazine, Instagram is now the easiest platform to showcase your outfits and personal style, turning the discover feed into a style catalogue that screams to be followed. 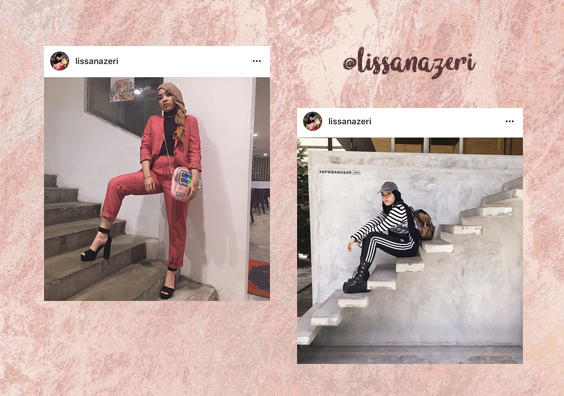 Muslimah fashion is fast emerging as a catalogue that is on trend now and we’ve scoured the scene to discover these 10 favourite fashionistas that are parading beyond headscarves and baju kurungs (a traditional Muslim wear). Bold, beautiful and modestly dressed, these ladies show us how they break beauty stereotypes while looking absolutely stunning! This wide eyed beauty is making heads turn everything. From chunky platforms to boots or even a fresh pair of kicks, there's no denying she has her shoe game on deck. Sticking mostly to neutral shades when it comes to the headscarf, she leaves the rest of her outfit to steal the limelight. She makes common street style pieces totally wearable when it comes to maintaining modesty while layering outfits and accessories for a totally chic look. Nina Khalil's style can only be described as flowy yet feminine. With quite the flare (and we mean it, literally! ), wide flare-hemmed clothing seem to be a staple in her wardrobe. We love the retro vibes of exaggerated tops and bottoms, especially when paired with a pair of heels for some va va voom elevation. Big on minimalism, this UK designer makes simple yet timeless pieces look so good! 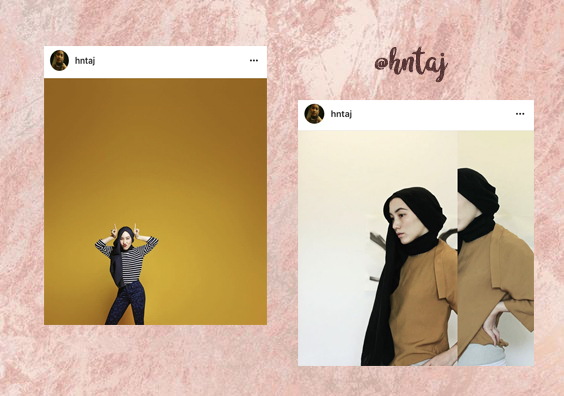 With her own line of modest-wear clothing with globally renowned brand - Uniqlo, Hana Tajima is no stranger to the fashion world. 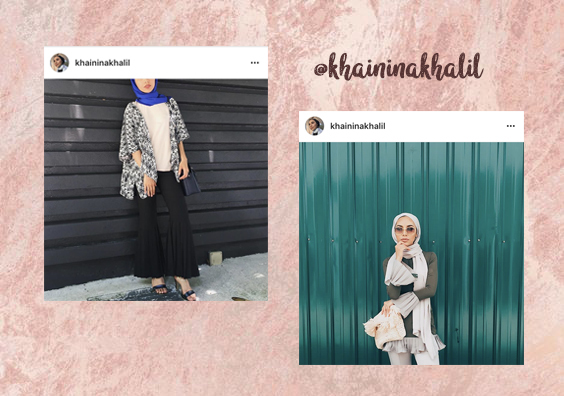 With muslimah fashion being relatively difficult to locate in popular stores, Hana aims to change that by designing ready-to-wear clothes that are easily attainable. Hana's style will add a fresh and clean feel to your Instagram feed, with earthy and neutral tones being the main theme on her account. Shahd Batal is a 20-year-old beauty and lifestyle Youtube creator who brings a whole new definition to glam. With a black hijab being her signature style, the stunning beauty oozes confidence in almost anything she wears. Her method of pairing cozy pieces like sweaters and sweatshirts with structured bottoms and a pair of statement shoes is absolutely foolproof. We can definitely see why her followers are crazy for her style! This cheerful beauty definitely knows a thing or two about the modest fashion world. Sticking to plain and neutral scarves, she chooses to add a unique style to her ensemble with oversized tops like denim jackets, cardigans and sweaters for the perfect slouchy look. She also shows us that the best accessory to any outfit is an infectious smile! This veteran blogger from Kuwait is also known as one of Middle East’s most famous and influential blogger and social media queen. With big brands like Dior, Chanel and Ralph Lauren under her belt, it is no surprise that this stunner knows how to make heads turn with her style. 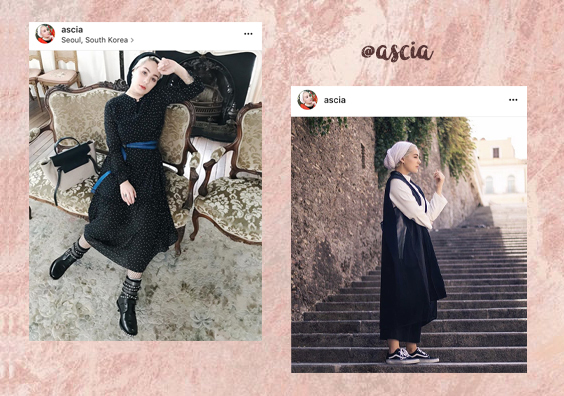 With the turban being her trademark head scarf style, she also loves experimenting with different looks - from girly prints to edgier and more masculine silhouettes, Ascia has truly mastered Muslimah fashion. This half Palestinian and half Puerto Rican beauty has definitely made a name for herself in the fashion world. She hits every mark when it comes to looking effortlessly glamorous without compromising on modesty. An expert at layering be it with clothing or accessories, she loves matching statement pieces - making her look that much more unique and individualistic. Hailing from Dubai, Leena is not one to shy away from loose and masculine fits. 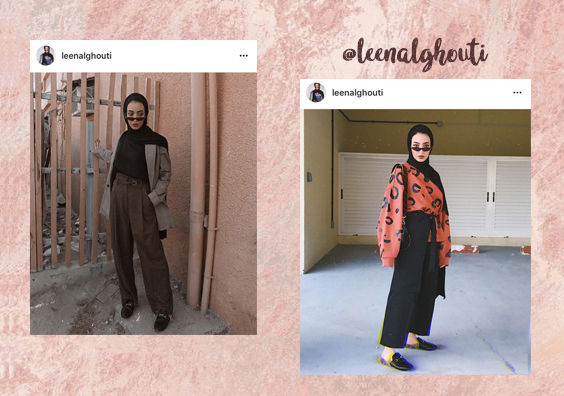 With the black hijab being a staple in her wardrobe, she loves pairing comfy bottoms like culottes with structured tops and sweaters for an androgynous look while still adding some feminine pieces. You’ll love her undeniably quirky ensemble! This Rotterdam native is a multitalented student/blogger. 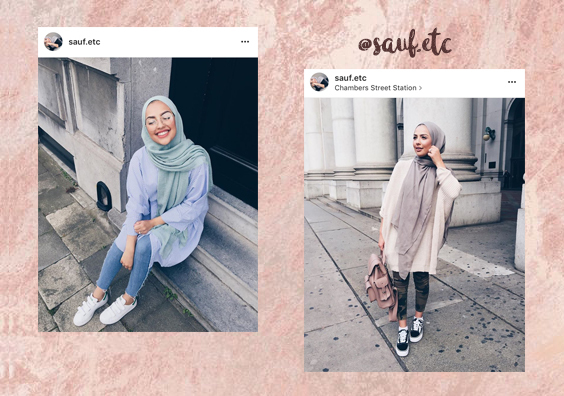 While the most of us struggled with looking great in college, Saara pulls off being a student and blogger, all while looking amazingly fashionable dressed head to toe in the cutest outfits! Long, cascading cardigans and kimonos seem to be a favourite of hers along with a pair of sliders for a totally adorable look without skimping on comfort. This Malaysian stunner has a knack for incorporating throwback pieces into her look, making her the ultimate retro goddess. 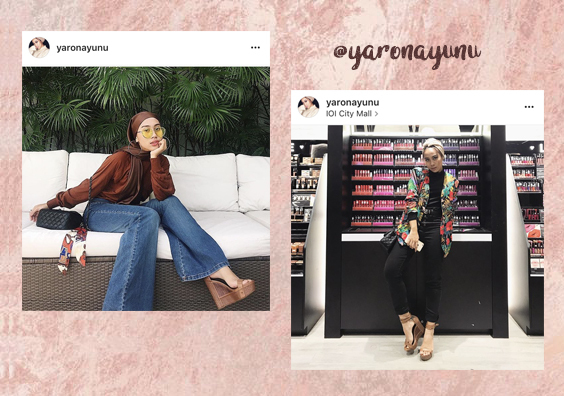 From tinted sunnies, high waisted flarejeans, to 80’s printed motif scarves, this cool cat’s wardrobe looks straight out from a high fashion magazine spread. Her makeup looks are also to die for, featuring lots of crazy and bright colors for any occasion! If you have ever marvelled at the porcelain skins of TV stars while watching your favourite K-dramas, you're not alone! 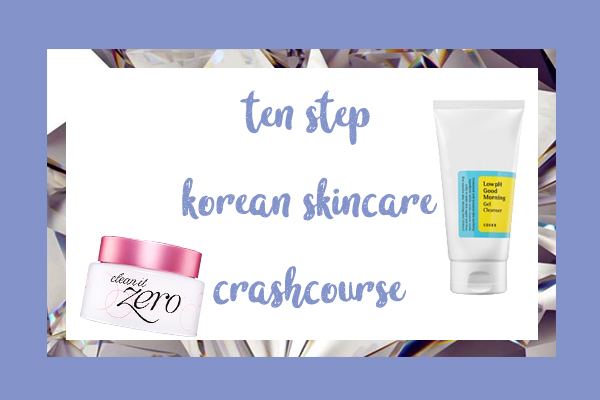 Yes, luminous skin can be achieved without layers of makeup or expensive treatments, and it can all be attributed to the infamous 10 step skincare routine that most Korean women swear by! Yup, that's 1,2,3...10 steps - an impressive upgrade from the regular cleanser, toner and moisturizer regime that most of us are familiar with and we can definitely see amazing results. Feel lost? Don't worry, we've got you covered! Here's a breakdown of each step to make it easier for you to attain that gorgeous skin! The first step of this extensive skincare routine is to, of course, wipe off all the makeup on your skin. Nothing clogs pores more than makeup residue on the face so never miss this important step! An oil-based balm or cleanser is ideal to break down all traces of makeup, including stubborn waterproof formulas. You may think double cleansing is unnecessary but we promise you, it is worth every effort! Cleansing with a water-based cleanser after removing your makeup further ensures that all irritants and residue are completely removed from your skin. Exfoliating is crucial for the removal of dead skin cells and other build-ups that can cause clogged pores. By removing the old layer of skin cells, a brighter and cleaner face is revealed. However, exfoliating should not be done every day (we think once a week is ideal) as overdoing it may irritate the skin and make it more sensitive. After cleansing and exfoliating, it's time to balance your skin and restore PH levels with toning. It also preps your skin to better absorb moisture from other products. For oilier and acne-prone skin, natural anti-bacterial toners that contain tea tree or witch hazel is great at targeting larger pores. If you have drier skin, a hydrating toner or lotion is great to restore the moisture level of your skin. The bridging step between toning and treatment, an essence is applied in a form of a thinner texture to further improve the moisture of the skin. Considered as the most notable step in the entire regime, Korean women swear by this miracle step that allegedly aids in cell turnover rate, unveiling fresher and clearer skin. Everyone’s skin differs, and there are a million treatments in the market targeted towards specific skin concerns. Be it acne, enlarged pores, wrinkles, sun spots, targeted treatments such as serums or ampoules can be applied on the skin to address such issues. Definitely the most fun and relaxing step in this regime, sheet masks are extra soothing and beneficial to the skin. Aside from the purifying attributes of sheet masks, putting on a soothing sheet over your face for 15-20 minutes to unwind after a long day of work sounds heavenly! Packed with concentrated serums that further hydrates and nourishes your skin, the thin material of the sheet mask allows for the most efficient method for product absorption. The eyes truly are the windows to your soul and also the part of your skin that is most delicate. Therefore, making sure that you properly hydrate and treat the area around your eyes is most important to minimize puffiness. With a suitable eye cream, it's time to bid puffy eyes and dark circles goodbye! Phew! 8 steps down, 2 to go! Seal in all your hard work with a final moisturizing layer. In our hot climate, it's important to hydrate religiously in order to maintain that dewy glow. Those with oily skin tend to shy away from moisturizers for fear of even oilier results but the secret is to find the best moisturizer for your skin type. For normal or oily skin, water-based or gel formulas are a lightweight option. However, thicker and heavier creams should only be used for drier skin. We cannot stress enough on the importance of sun protection during the day, even in gloomy weather! UV rays can really damage the skin, making it more sensitive and prone to darkening of scars and stubborn spots. And if you are worried about premature aging of your skin, make sure to apply sunscreen every time you head out the door! We all love the 31st of October. Halloween night! It’s the only night in which our creativity comes in full force, surging our minds with endless ideas on what to wear for Halloween. Although trick or treating isn’t an option for us, it doesn’t mean we’ll be staying home and binge watching horror movies on the spookiest night of the year. Dressing up is always a must, what with all the endless parties and events with costume themes going on. Although we do applaud the effort some people put into their costumes like renting or even buying specific clothes that will only see the light of day once a year, you don’t necessarily need to do that! Here at Shoppr, we are great advocates of reusing your clothes and styling it differently to create multiple looks, giving the word versatile a whole new meaning. For this year’s Halloween (and many more to come, we hope! ), try shopping for versatile pieces that are significant enough to be part of your costume but also able to be worn on a daily basis, killing two birds with one stone! 2016 saw a multitude of Netflix shows that left us with many sleepless nights and Stranger Things was definitely one of it! We totally love the throwback to the 80’s theme of the show, fanny packs, ringer t-shirts and Chuck Taylors! Our favourite character was definitely Eleven. Though you don’t need to have mind bending powers and a bloody nose, a blue bomber jacket and pink dress can definitely suffice. We love the blend of boyish and girly clothes of Eleven, the perfect embodiment of all pre-teen girls in us growing up. Gather a few of your best girlfriends and prepare to look totally fetch this Halloween. We’d like to collectively agree that Mean Girls is a movie we can watch multiple times, recite every hilarious line and still not get bored of it. It’s totally easy to recreate the wardrobe of Regina George and her sidekicks, you might even have some of the quintessential items needed buried in your wardrobe. The things you need include: a mini skirt, sassy high school queen attitude and most importantly some pink, because on Wednesdays, we wear pink! If you’ve always wanted to channel your inner Goth girl but don’t want to come off as too intimidating, Halloween is the perfect time to try it out. 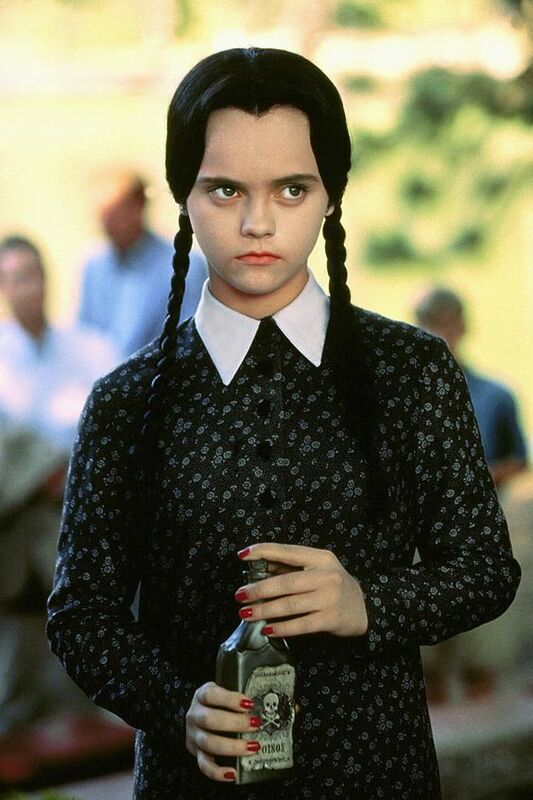 Get your hair into a double braid and put on your grimmest face, because Wednesday Addams is here for Halloween! Lucky for you, childish giggles and hopping around wouldn’t be necessary due to Wednesday’s deadpan demeanour. All you need is the hair, a collared black dress and an eternally soulless facial expression to nail this look. With the revival of the 90’s trend, nothing is more perfect for a throwback style icon than Cher Horowitz from Clueless. Just the scene of her picking out her outfit from a virtual closet has got us gushing with envy. If you’ve watched Iggy Azalea and Charlie XCX’s music video for their hit song “Fancy”, you’ve probably noticed how they paid homage to the iconic movie. However, you certainly don’t need a team of stylists to curate the perfect outfit for channelling your inner Cher Horowitz. All you need is a plaid skirt, thigh high socks and a fitted sweater to look like the preppy princess herself. Extra points too if you happen to have a furry top pen lying around.